If you fit into the first category, then you can find the page dealing with how to make a kilt, simply by following the link to that page. If on the other hand your interest lies in how and why the different patterns are produced, then read on. The kilt pattern, which when given its proper name Sett, is always arranged vertically and horizontally, the only time you will see it used diagonally is when tartan fabric is adapted to make a ladies skirt. Kilts are made from twill woven worsted wool (at least quality kilts are), and the twill weave used is a 2-2 type. All this means is that each weft thread passes over and under two warp threads at a time, thus producing a distinctive weave pattern in the cloth called the twill line. 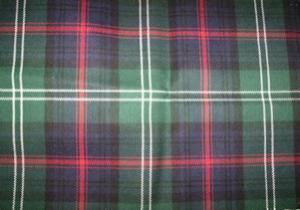 This kind of twill when woven according to a given colour pattern, or sett, is called tartan. Setts are specified by their thread counts, the sequence of colours and their units of width. For example the thread count K/4 R/32 K/32 Y/4 (K is black, R is red, and Y is yellow). This means that four units of black thread will be succeeded by thirty two units of red, etc, in both the warp and the weft. The units are the actual number of threads. Setts are also characterized by their size, the number of inches in one full repeat. The size of a sett depends not only on the number of threads, but also on the weight of the fabric. Heavier weight fabric has thicker threads, so therefor the same number of threads of a heavier fabric will occupy more space. The finest quality tartan in the world, is woven on Scottish looms, and all tartans are registered with the Register of Scottish Tartans. They maintain a collection of fabric samples identified by name and thread count. There are approximately 5000 registered tartans, with more being added every year. If you would like any further information on the different tartans available, please drop me a line using the Contact Us page, I am always happy to help.